So recently we were invited to an evening of board games and drinks with friends. Everyone was asked to bring a bite that could be easily eaten with the fingers and Kevin and I decided that we would each tackle one bite. He would tackle the savory and I would be in charge of the sweet. Kevin loves to try new things and blow people away with the unexpected. That is part of what makes him so fearless in the kitchen. He also knows what he is doing and I think that knowledge goes a long to producing bold and creative results. 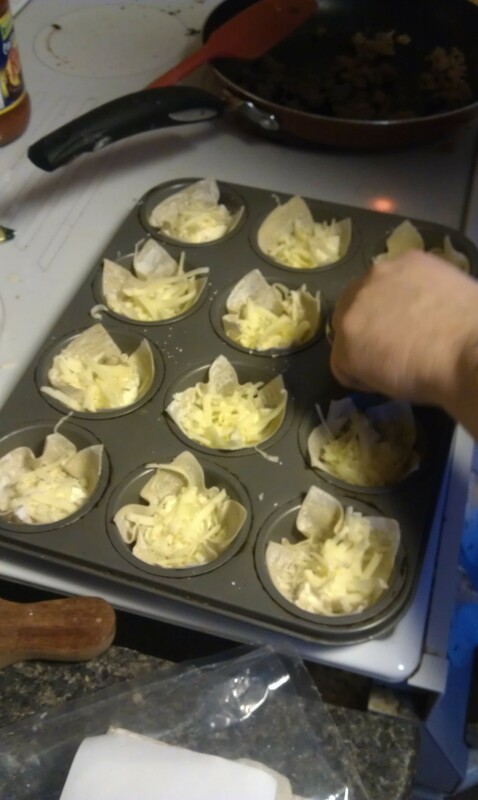 So while looking for ideas he comes across for an idea for Lasagne Cupcakes from this blog post. When he told me he wanted to try making these as our savory bite I was thrilled with how creative it was. Kevin always likes to try out new recipes before presenting them so Friday night before our get together Kevin decided to try this idea out on the family. Wonton Wrapper with the 3 cheeses. This is when we started out with our family trial run. Kevin decided that he wanted to go with no cutting the wonton wrapper and having it be whole and going with what was termed as a ” rustic look”. The three cheeses are layered one on top of the other. Meat layer on top of the first cheese layer. Then we have the meat layer on top of our three cheeses to which the sauce was drizzled on. After these steps you put another wanton wrapper on and repeat the cheese, meat, and sauce layers one more time finishing with some mozzarella cheese on top. Fresh from the oven and ready to serve! The kids did enjoy this different form of finger food. They took to it with a lot of excitement and the reviews were good. Kevin felt that they were a bit chewy and that it could have been tweeked a bit more to bring a bigger flavour. When Kevin uses a recipe he always goes and reads the comments and feedback from others to help make what he is cooking more flavourful and often learns a new trick this way. In his searches and reviews he finds this recipe from Food Network that appears to be the inspiration for the blog post his inspiration came from. 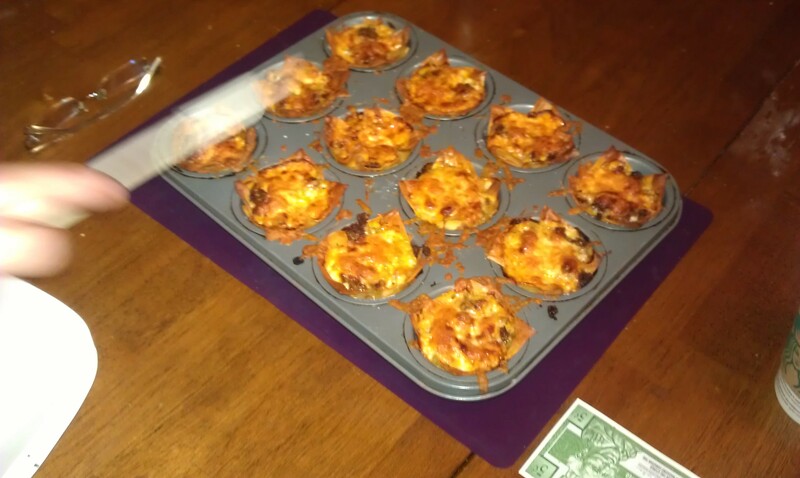 When we went to make the cupcakes for our party he took the suggestions from Aarti to blend the 3 cheeses of ricotta, parmesan, and mozzarella into a filling like you would do for a traditional lasagna and to combine the sauce with the browned meat instead of doing them as two separate components. 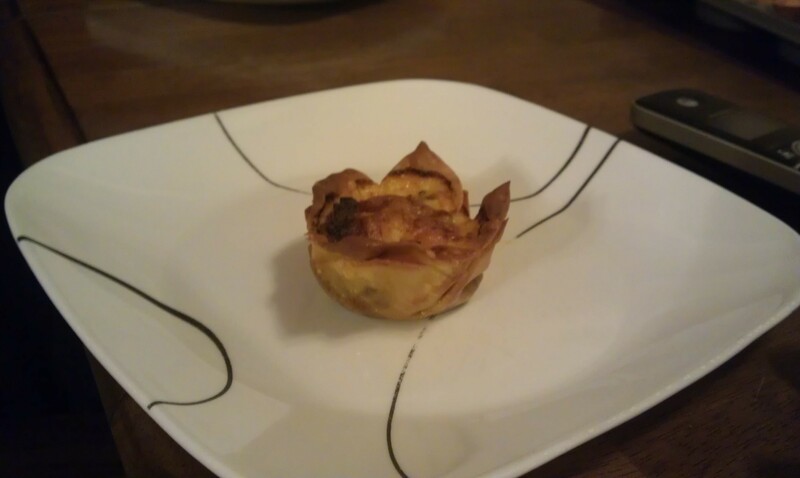 This also made it much easier to press the layers down into the muffin tin which got the filling spread out evenly over the wonton base and allowed for the flavours to be found in each bite. He also added basil into the cheese mixture to help give a bit more of that lasagne flavour. Finished product on plate to be served to our 3 year old. My bite, I’m proud to say, came out of my head with just a bit of encouragement from Kevin. In the end I called it a Black Forest Tart because my goal was for folks to think of that when they took their bite. I’m pretty happy to say that I managed to be successful in my goal. I started with 3 cups of frozen dark sweet cherries and tossed them in 2 tablespoons of white sugar and 1 tablespoon of all purpose flour. I set them aside to come together while I pre-heated my oven to 350F. As I was experimenting I decided to go low temp and take a bit longer to get my desired results than risk cooking them too fast and burning it. I am fairly certain that next time I could go 375 for 20 minutes. 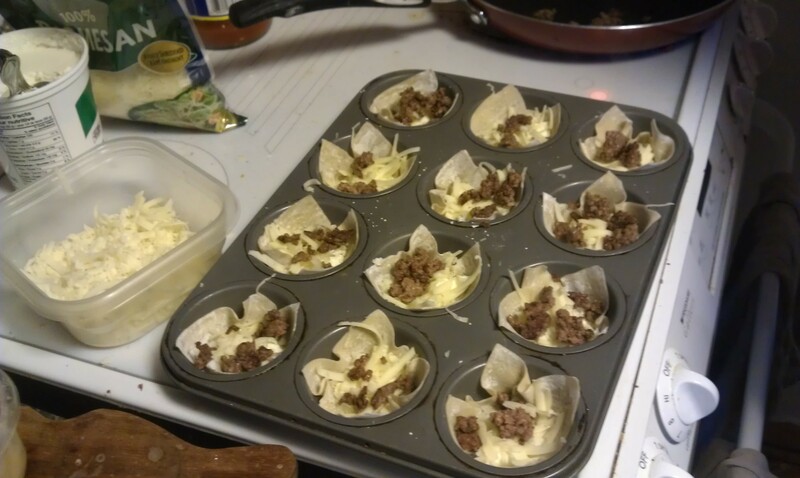 Pre-made mini tart shells courtesy of Tenderflake. Now pastry is something that is on my culinary bucket list. I’d like to make a perfect pastry and get the perfect decorative edge. While I work toward this goal anything that I plan to put out to people I am neither married or related to I take an assist from those who are more experienced in these matters. So Tenderflake to the rescue! I followed their suggestion of taking out the tart shells and giving them 10 minutes to thaw a bit. I did this while I was pre-heating the oven and letting my cherries sit with the flour and sugar coating. Cherry puree with whole cherry in the middle. I was trying to go for a bit of a presentation vibe in my experiment so after the 10 minutes thawing time as suggested by Tenderflake I counted out one whole cherry for each tart on the sheet (36) and then took the remainder of the bowl contents and pureed them through my mini chopper. I took a teaspoon and spooned out a small amount of the cherry puree to cover the bottom of the tart shell and then placed my cherry in it. I found the puree helped to keep the cherry in place in the centre for the most part and it also cooked up around it nicely. 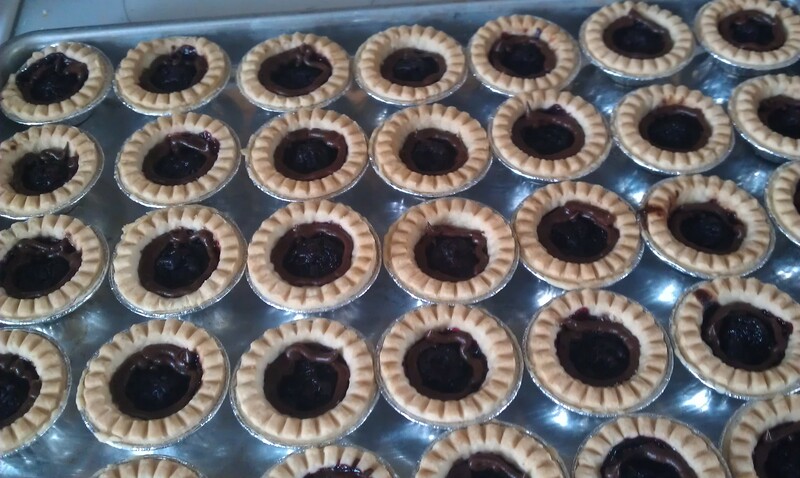 Finished tarts after being in the 350 F oven for approx. 30 mins. I will admit that I was hovering as my oven was baking my bites but when they came out I felt really impressed so far as they looked pretty good and weren’t burnt because I was so gentle in making them. While they were baking I took the time to make my whipped cream. Some of the Black Forest Cakes I have had often some shaved almonds along the outside of the cake. 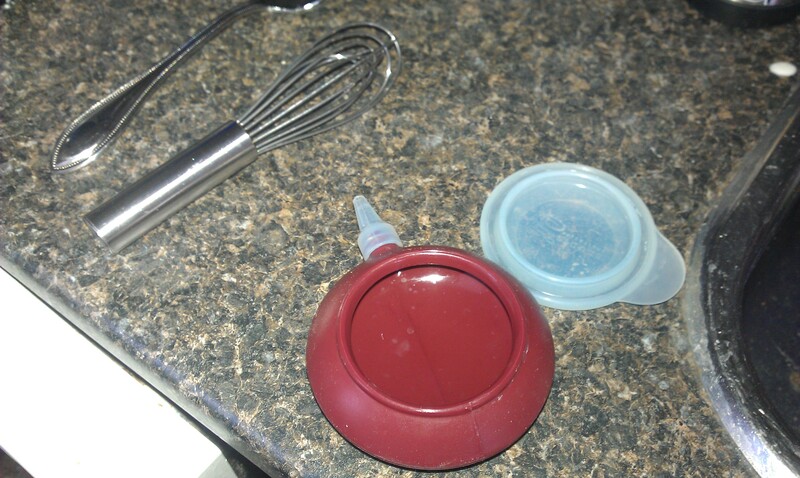 While making my whipped cream I added 1/4 teaspoon of artificial almond extract to 500 mls (2 cups) of whipping cream. Melted chocolate combined with whipped cream. Chocolate Decorator from Epicure Selections. 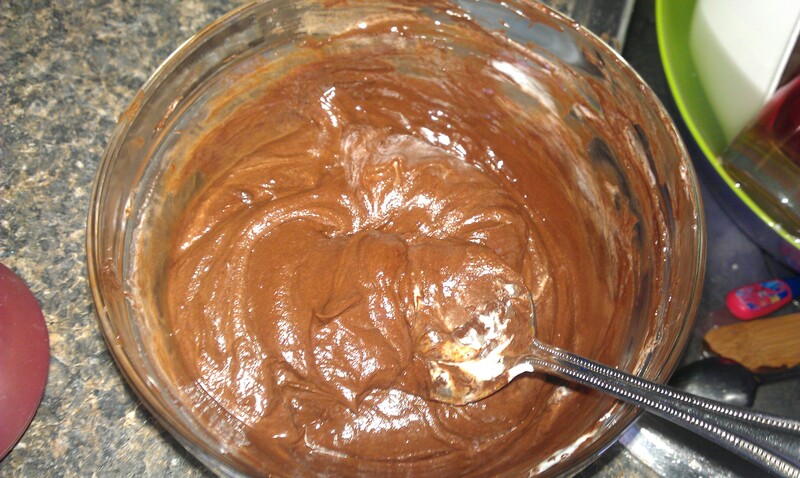 Next I attempted what can only be called as a chocolate whipped cream. Originally I had thought to just melt some chocolate chips and drizzle it on top of the tart but then I began to think bigger and figured I would blend the chocolate with some of the almond whipped cream I had just finished making. I started out with about 1/2 cup of semi-sweet chips and 1/3 of a cup of dark chips left over from my Triple Chocolate Bribe and put them in the microwave at 30 second intervals stopping to take them out and stir them while they melted. Once I was confident that they were all melted I put in about 3 heaping tablespoons of my almond whipped cream and folded. I was fully prepared for the possibility that my chocolate would seize and I’d be serving a cherry with almond whipped cream tart instead but figured I’d take the chance. After all no guts no glory. However, as I combined my chocolate and whipped cream and they came together so very nicely and I had a good consistency for piping I reached for what was an impulse purchase at the time…my Chocolate Decorator from Epicure Selections. Using the whole cherry as my focal point I put the chocolate whipped cream around it. I loaded up my Chocolate Decorator and started going around the cherry. In my head I wanted the chocolate and whipped cream to be the accents to the whole cherry I had stood up in the centre of the tart. The decorator worked well but I wonder now if my icing gun might not have been a better choice for a more consistent bead of chocolate and perhaps would have been able to get a bit more chocolate in the space I had left with the intent of using it as a channel for my chocolate and whipped cream finish. Whipped cream for the finishing touch! Now for the final touch of whipped cream! When I was trying to come with a way to finish the tart with the whipped cream I ideally wanted to use my round tip with my decorating gun but when I went to get the pieces I found my round tip is currently missing. I ended up going with my leaf tip and realized that I might need to invest in a new decorator gun as my trigger doesn’t seem to apply pressure anymore. So while my tarts didn’t have the perfect piping around them they did end up with the flavours I wanted to put together. I got more than one person that commented they got what I was trying to put together but some of the feedback was that not every tart had that complete flavour profile I intended but the reviews were all good. Kevin stated that they were awesome. I’m sure I am not the first one to come up with this style of tart but here is how I got my flavours together. 1) Heat oven to 350F. 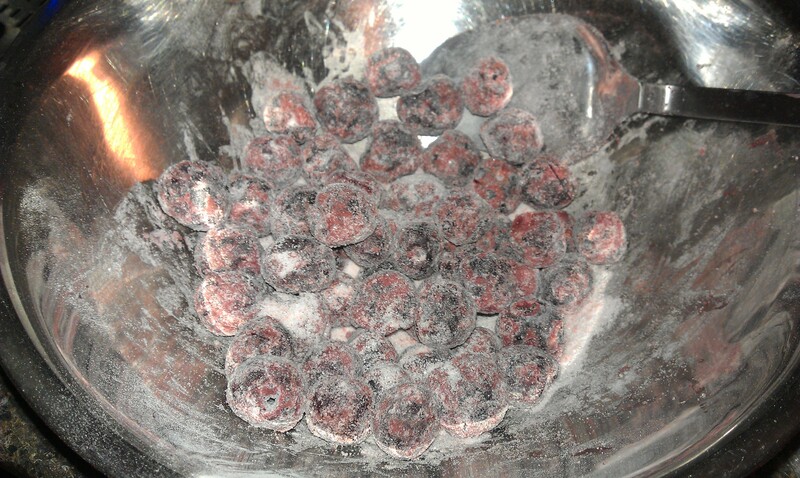 Combine the cherries with the sugar and flour in a bowl and set aside. Remove tart shells from box and place on cookie sheet. Thaw for 10 minutes. 2) Count out the number of whole cherries you will need for each tart and set aside. Put the remaining contents of the cherries/flour/sugar bowl into a blender or chopper and puree. 3) Take a teaspoon and line the bottom of each tar shell with enough puree to cover the bottom. Place a whole cherry in the centre of the tart and place in oven. 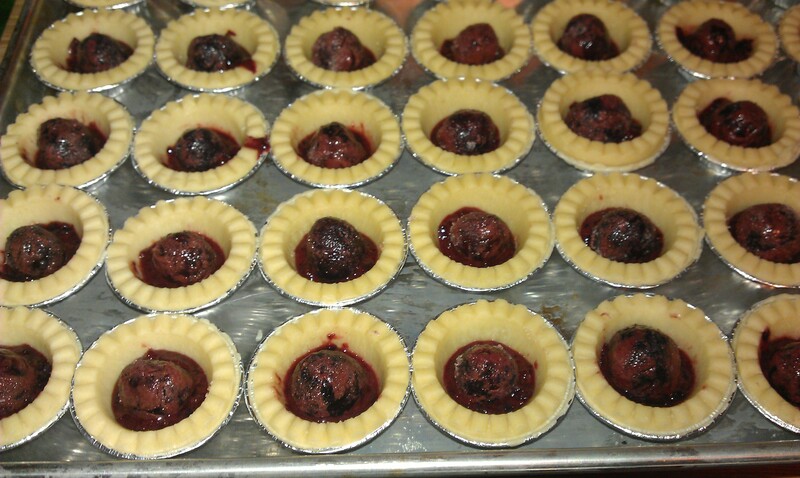 Cook until the cherry puree is no longer liquid in appearance and the tarts shells are brown on the edges. 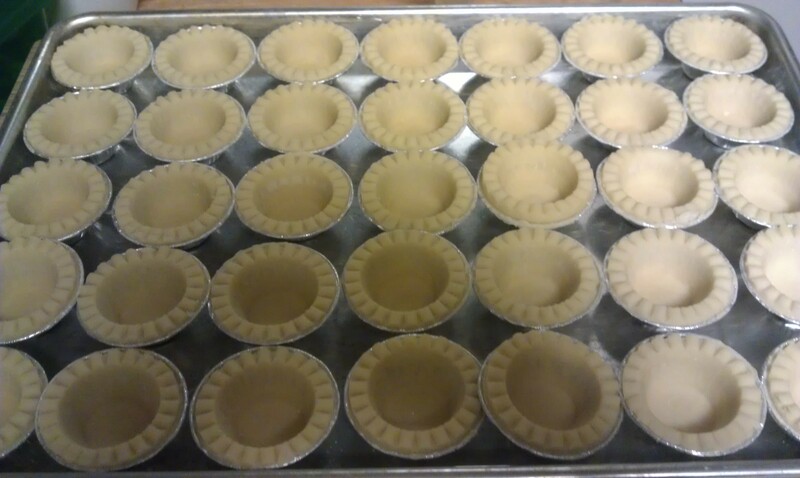 Remove and allow tarts to cool. 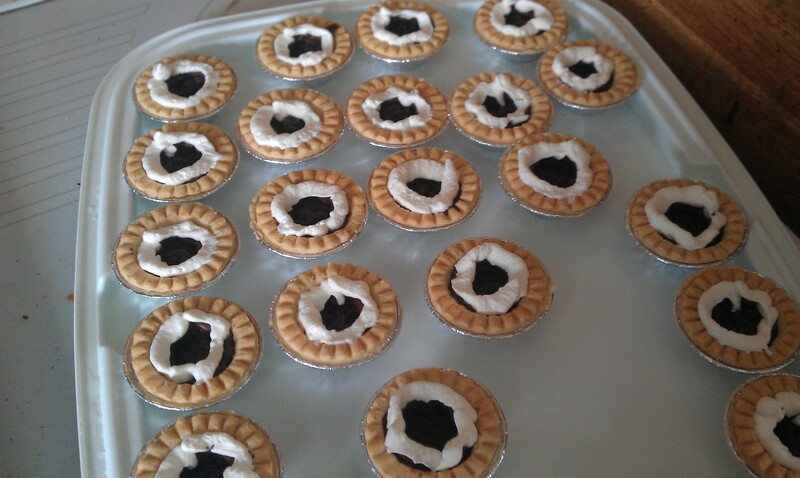 4) While tarts are cooling take 2 cups of whipping cream and add the 1/4 teaspoon of almond extract in using. Whip until the cream is stiff enough you could pipe it though a bag. 5) Combine semi-sweet chips and dark chocolate chips in a microwave safe bowl and heat at 30 second intervals. Remove and stir between each 30 seconds until the chocolate is melted through and warm. Add 3 tablespoons of prepared whipped cream and fold in. 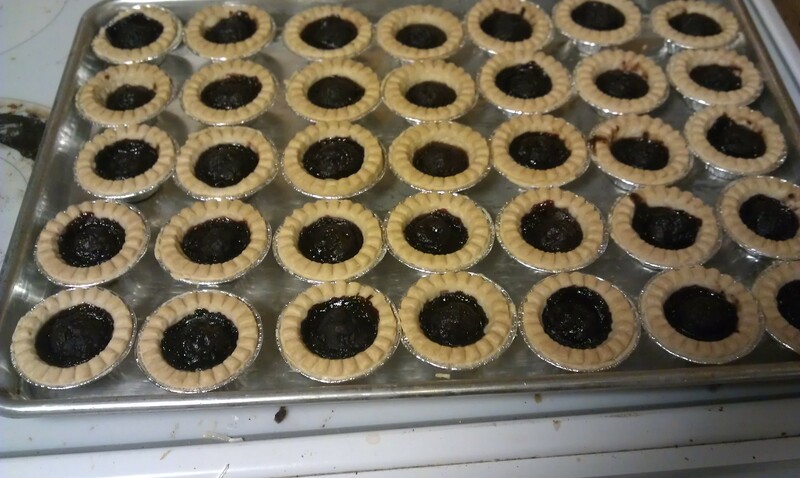 Place in piping container and pipe around the cherry in the tart. 6) After you have piped the chocolate take the whipped cream and place it either in a piping bag or decorating/icing gun. Pipe whipped cream on top of the chocolate and around the cherry. Be sure to keep chilled until ready to eat. Posted on February 4, 2013 by Shirley Robert	• This entry was posted in Cooking with Kids, Recipes, Social Eating and tagged almond, black forest, cherries, chocolate, cupcake, finger food, lasagna, lasagne, mozza, muffin tin, parmesan, pot luck items, ricotta, savory, sweet, tart, whipped cream, wonton. Bookmark the permalink.